Android Device Manager is a new online service that allows its users to track their Android handsets and send a command to them, including one that enables remote data wiping. Android may have a lot in store for its users, but it has not offered something to match Apple's "Find My iPhone" tracking service so far. In a recent blog post, Google announced the introduction of a service called Android Device Manager that helps anyone track down a stolen, lost, or simply misplaced handset. To locate your Android phone or tablet, you have two choices - call it and make it ring at maximum volume (this is possible even if it has been silenced), or simply use the map. Obviously, this real time tracking feature works hand in hand with Google Maps. At last, there's another very useful feature - remote data wiping. If you know your phone was stolen or can't be recovered from its location, you can just securely erase all the data on it remotely. 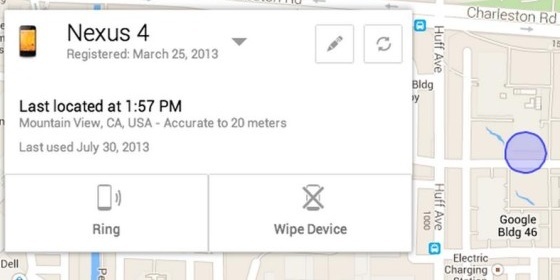 Compatible with devices running Android 2.2 and above, the Android Device Manager tracking down service is expected to become available "later this month". We are watching this subject and we'll get back to it as soon as that happens.